The popular fast food giant has got me wondering if this new addition to their menu is worth the money. I opted for the solo piece for trial before shelling out P82 for a package of three. 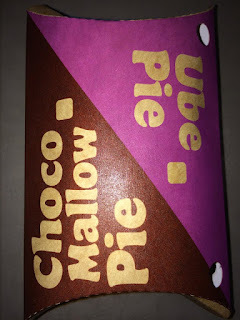 Ube or Yam is the main ingredient this time, I adored their previous pies namely: peach mango, choco malllow, and the tuna (the first one mentioned being my most favored). I waited patiently for 10 minutes even if I have been thinking about it all day because the cashier said they're saleable. After my first bite, I didn't get to taste the core yet so I did a second. The filling was too hot and I intended to eat it that way. It isn't too much sweet, it was just right for my preference. The crust was crispy as usual and the amount of filling was satisfactory. 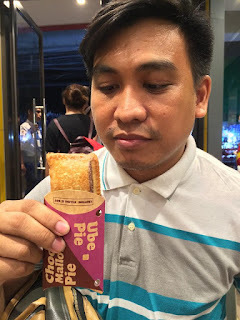 Overall I wasn't much impressed as the Peach mango pie. The sweetness of the Ube pie is just right that it made me purchase another one. 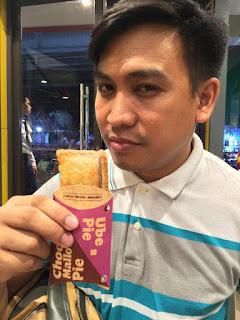 Yes, it's dee-licious and for Php 29 a piece, it's not too bad at all. Well that's just me. Good job mr bee. I'm rating it 4 out of 5 stars.